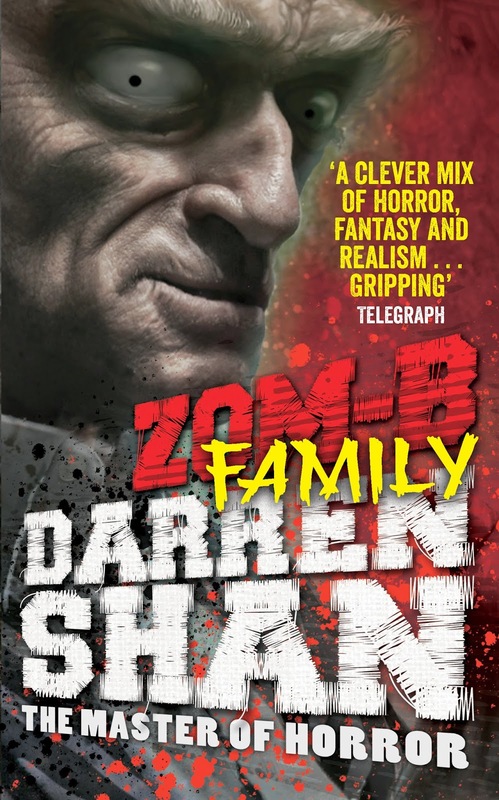 NOTE: ZOM-B FAMILY IS THE NINTH BOOK IN THE ZOM-B SERIES BY DARREN SHAN. IT GOES WITHOUT SAYING THAT THIS REVIEW MAY CONTAIN SPOILERS. IF YOU DO NOT WANT THIS SERIES SPOILING, OR IF YOU HAVE YET TO REACH BOOK NINE, PLEASE PLEASE PLEASE STOP READING NOW... I DO NOT WANT TO BE RESPONSIBLE FOR SPOILING THE STORY FOR YOU, ESPECIALLY ONCE YOU HAVE BEEN WARNED! THANK YOU. Official synopsis: "The ninth terrifying installment from master of horror, Darren Shan. CAN ANYONE HURT YOU AS MUCH AS A LOVED ONE? WHEN DOES THE FIGHT BECOME TOO MUCH TO BEAR? HOW MUCH PAIN CAN ONE PERSON ENDURE? B Smith is discovering the true meaning of family ..."
The book opens with the fallout of the treacherous act at the end of Clans, book eight. Rage has betrayed B and the Angels and has joined Dan Dan and his cronies. But even they are wary of him. He is a zombie after all, one scratch is all it would take to bring down the entire complex that has made itself at home in what used to be Battersea Power Station. B is screwed and she knows it. She is briefly reunited with her father, but even the end of the world cannot change his ways and he is as deep as he can get with the Ku Klux clan who see the zombie apocalypse as a way to clense the world racially and bring about their new world of purity, as they see it. B is disgusted and choses not to side with them, and rightfully so, but this puts her at the mercy of Dan Dan and he finally gets his hands on her, after taunting and threatening to destroy her over the past few books. But it isn't long before trouble really begins and B is forced to fight, her body riddled with holes, her guts held in only by some bandages and her ears cut off, to save her friend Vinyl. I really liked how this shows that those in power aren't changing at all. They have no regard for the lives of anyone but themselves. I also loved seeing Dan Dan finally, FINALLY, getting his comeuppance. I think he's one of the most disgusting, revolting and yet enticing characters Shan has ever made but seeing him go wasn't a sad moment at all. I like it when the bad guys bite the dust and whilst I felt the way Dan Dan demised was a little rushed and unexpected (I REALLY WANTED IT TO BE B!!!) it felt right and satisfying! And then the clown returns. Mr. Dowling. Although he is perhaps the scariest character I think Shan has ever created, after he first turned up in Underground and City I actually had nightmares, I have really missed him over the last few book. He's always been sort of an omnipresence in the series. Mentioned here and there, spoken about at length by Dr Oystein but only appearing rarely, so getting to see him again was great. I feel he's going to be a lot more prominent from this point on until the end of the series. This book is honestly the darkest I think I've ever seen Shan and you know what? I loved it. It is a great addition to the series and the ending sets up the next book, Zom-B Bride, very well. I cannot wait to see what is going to happen next. I want to see where those babies are taking B and I really want to know what the connection is between them. It's creepy and it's something that has been hinted at all the way through the series, and with just three books left, I sense that things are about to start wrapping up and we are finally going to start getting some answers. I hope so! I cannot wait!